List Rules Which of these movie scenes are most cleverly hidden? A well-crafted and visionary film is essentially a living entity with infinitely varying facets. For every single shot in a horror movie, there's a wealth of peripheral images to analyze - bizarre background action or creepy movie Easter eggs that are just waiting to be discovered. Not all of the above-mentioned symbols are designed to be enigmatic, however. Some ostensibly "hidden" messages in movies are hiding there in plain sight. The legendary David Lynch, for example, is well known for making brilliant art in every shot but as evinced by many bizarre behind-the-scenes Hollywood stories even Disney has been known to dabble in bawdy subliminal imagery. Read on for a wholly unexpected list of creepy things in the background of movies. 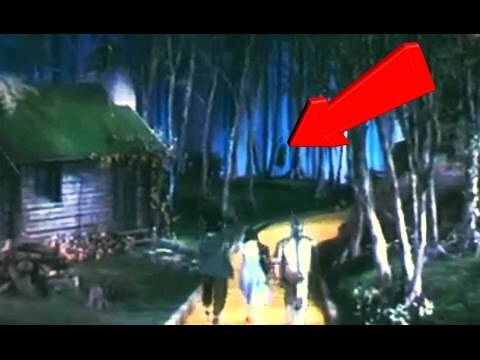 The Wizard of Oz's hanging munchkin controversy is surely one of filmdom's most famous legends. The nature of the image has neither been confirmed nor denied but according to BBC, a dwarf actor was driven to despair and the most desperate of measures because of an unrequited love for a fellow munchkin. However, other sources state that the hanged man was actually just a perching bird that happened to resemble a corpse. So the upshot seems to be that if the vision of a dangling munchkin appeals to you, go with it. The exact moment in which the suicide is said to appear is indicated in the above video. There's A Surprise Photobomb In "Poltergeist"
To visit Poltergeist's IMDB page is to discover a world of often disquieting behind-the-scenes insights. A particularly horrific moment in the film occurs while Diane Freeling blow dries her hair. As IMDB explains it, a "normal family collage of family shots" can be seen behind Williams but after the clown attacks her son Robbie, a "devilish looking character" can suddenly be seen in one of the picture frames. A Dead Woman's Face Appears Out Of Nowhere In "The Exorcist"
As it turns out, William Friedkin's 1973 masterpiece The Exorcist contains a lot more subliminal background images than even diehard fans noticed. One such image appears during the penultimate scene in which Father Karras demands that the devil enter him. Just before he heroically throws himself out Regan's bedroom window to die a gruesome death, Karras's dead mother's face appears in the glass. The Car From "Psycho" Makes An Appearance In "Halloween H20"
When Janet Leigh appears in 1998's Halloween H20, she gives a whimsical nod to her most famous character, the ill-fated Marion Crane from Alfred Hitchcock's Psycho. Savvy viewers will note that the car Leigh exits in the above still is the very same vehicle that Norman Bates encapsulates Marion's corpse in. Even the license plates are the same.